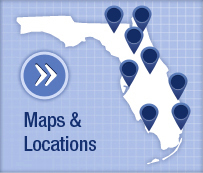 Head injury is a common reason for an emergency room visit. 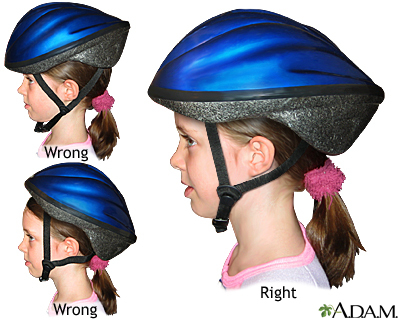 A large number of people who suffer head injuries are children. Traumatic brain injury (TBI) accounts for over 1 in 6 injury-related hospital admissions each year. Most of these injuries are minor because the skull protects the brain. 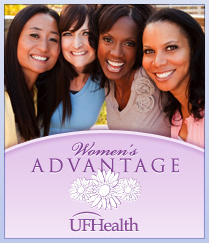 Some injuries are severe enough to require a stay in the hospital. Head injuries may cause bleeding in the brain tissue and the layers that surround the brain (subarachnoid hemorrhage, subdural hematoma, epidural hematoma). Symptoms of a head injury can occur right away. Or symptoms can develop slowly over several hours or days. 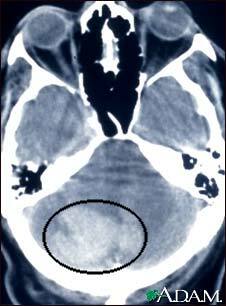 Even if the skull is not fractured, the brain can hit the inside of the skull and be bruised. 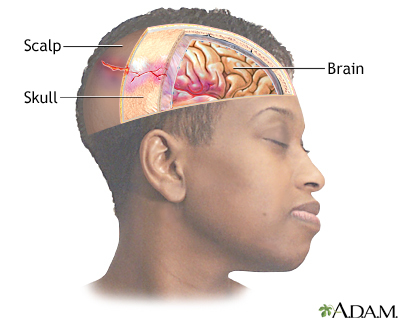 The head may look fine, but problems could result from bleeding or swelling inside the skull. The spinal cord is also likely to be injured in any serious trauma. Some head injuries cause changes in brain function. This is called a traumatic brain injury. 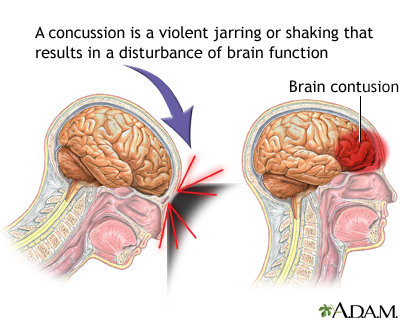 Concussion is a mild traumatic brain injury. Symptoms of a concussion can range from mild to severe. Learning to recognize a serious head injury and give basic first aid can save someone's life. For a moderate to severe head injury, CALL 911 RIGHT AWAY. Check the person's airway, breathing, and circulation. If necessary, begin rescue breathing and CPR. If the person's breathing and heart rate are normal, but the person is unconscious, treat as if there is a spinal injury. Stabilize the head and neck by placing your hands on both sides of the person's head. Keep the head in line with the spine and prevent movement. Wait for medical help. Stop any bleeding by firmly pressing a clean cloth on the wound. If the injury is serious, be careful not to move the person's head. If blood soaks through the cloth, do not remove it. Place another cloth over the first one. If you suspect a skull fracture, do not apply direct pressure to the bleeding site, and do not remove any debris from the wound. Cover the wound with sterile gauze dressing. If the person is vomiting, to prevent choking, roll the person's head, neck, and body as one unit onto their side. This still protects the spine, which you must always assume is injured in the case of a head injury. Children often vomit once after a head injury. This may not be a problem, but call a doctor for further guidance. Apply ice packs to swollen areas. 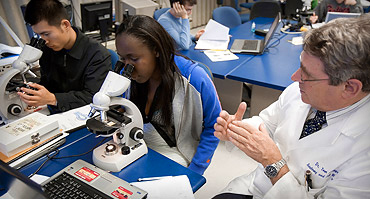 A serious head injury that involves bleeding or brain damage must be treated in a hospital. For a mild head injury, no treatment may be needed. However, watch for symptoms of a head injury, which can show up later. Your health care provider will explain what to expect, how to manage any headaches, how to treat your other symptoms, when to return to sports, school, work, and other activities, and signs or symptoms to worry about. There is severe head or face bleeding. The person is confused, tired, or unconscious. 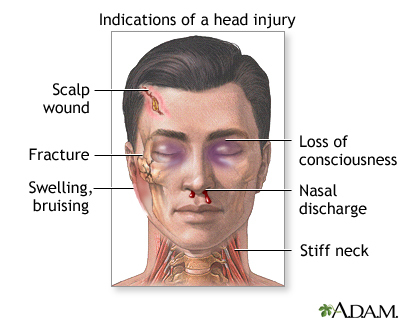 You suspect a serious head or neck injury, or the person develops any signs or symptoms of a serious head injury. Do not drink and drive, and do not allow yourself to be driven by someone who you know or suspect has been drinking alcohol or is impaired in another way.